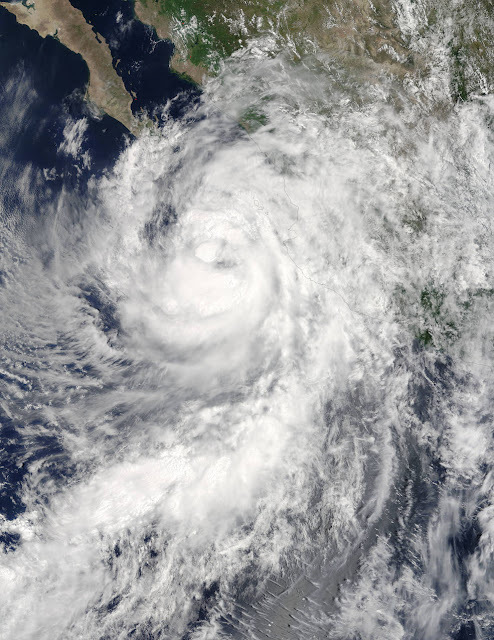 NASA's Terra satellite and a NASA animation of imagery from NOAA's GOES-West satellite provided views of Hurricane Newton as it neared landfall in Baja California, Mexico, today. Hurricane Newton has battered Mexico's northwestern resort of Los Cabos, tearing down trees and blowing away tin roofs, officials say. The powerful storm packed 145 kilometer-per-hour winds and caused landfall before dawn on Tuesday at the southern tip of the Baja California peninsula. Local airports closed late Monday while small boats were barred from using the ports. Schools were also shut down in the affected region. Locals put tape on shop windows as the hurricane approached north of Los Cabos in La Paz, the capital of Baja California Sur. Los Cabos civil protection director Marco Antonio Vazquez told AFP that authorities were still assessing the possible damage. "The winds are very strong," Vazquez said, adding, "For now the damage includes a lot of branches, a lot of fallen plants, many trees." The official said he also saw telephone cables as well as tin roofs from poorer neighborhoods on the streets. Vazquez confirmed that authorities opened shelters with capacity for 16,000 people across the state. Some 1,500 people took refuge in shelters in Los Cabos, he added. The hurricane also knocked out power in some places as stranded tourists huddled in their hotels. About 14,000 tourists are in Los Cabos and some 1,000 elsewhere in the worst-hit region.